The 1967-68 racing season was not quite as successful as the preceding season. The club's eight, again under Hubert Frederico, saw the introduction of a number of new men to senior rowing, including Jim Bourke. The year was an Olympic selection year, and riverbank observers were not surprised to see the old guard from Mercantile join forces with Stuckey and McBain of Essendon Rowing Club and Ramage and Guest of Banks to form a V.R.A. composite senior eight under the guidance of David Boykett. The composite crew and Mercantile, after a tense training build-up, met for the first time at the Upper Yarra regatta. The composite crew, amid great jubilation, lowered Mercantile's colours easily. With the State Championship to be rowed on the Barwon the following Saturday, Mercantile looked to be in difficulties. Hubert Frederico worked his crew with uncharacteristic severity in the early part of that week. The work was absorbed and when the two crews met to row the metric Barwon course going upstream on the Saturday, Mercantile, reputations in the balance, rowed a brilliant first 800 metres to lead narrowly and drew away over the final stages to win well. Gillon, Douglas, Johnston, G. Boykett and Palfreyman from the club were selected into a State crew with Tom Daffy again as cox. The State crew was not doing well when it reached Penrith for the final stages of training. Frederico performed wonders during the next week and when New South Wales and Victoria went to the starting line on a windy and overcast finals day, Victoria was at least a serious rival for the polished and powerful New South Wales combination. The race, one of the fastest in the King's Cup history (being rowed in 5 minutes 43 seconds) was a great spectacle. The crews were locked together to the 1,000 metres, when N.S.W. sprinted half a length clear. Victoria attacked at 600 metres to go, and drew to within a canvas with 15 strokes remaining. Victoria, still accelerating, crabbed suddenly allowing N.S.W. to draw away and win by one-third of a length and thus gain the Olympic selection. The Mercantile/M.U.B.C. IV of Boykett, Douglas, Gillon and Harry reformed immediately for the Mexico Olympics test races to be held at Murray Bridge, South Australia. It won the fours test race from Tasmania by 1 1/2 lengths in a bad head wind and chop. Although it had been announced that a coxed four would represent Australia at the Olympics, the Australian selectors graded the Mercantile based crew below the N.S.W. eight and coxless pair, with the result that the four could not be sent. David Douglas from the four was subsequently selected in the Australian Eight for Mexico which recorded Australia's best-ever rowing performance - a silver medal, 0.98 seconds behind West Germany. In other divisions, the club did well in 1967-68. It won the Junior Four and Lightweight Eight Championships and again, the senior and junior premierships. An Australian rowing team was sent to New Zealand in October, 1968, and eight Mercantilians were selected, Graeme McCall being coach. The 1968-69 racing season saw Mercantile continue in supremacy. The club won the senior eight and junior four championships and the senior and junior premierships. The senior eight saw several seating changes. The final crew included Peter Knowles, Martin Tomanovits, Bob Lachal, David Palfreyman and a talented youngster out of the 1967 Scotch College crew, John Shanasy. Hubert Frederico gave way to David Boykett as coach. Peter Philp, who had rowed in the eight before Christmas, was not selected. Malcolm McKenzie and John Burford retired. The championship race was due to be held at Ballarat on February 15, 1969. A car in which several of the crew were travelling to the regatta was involved in an accident which resulted in serious injury to Martin Tomanovits and David Palfreyman. The crew started with their seats being filled by Rob Connolly, a lightweight, and Hugh Foley, an American visitor who had rowed in the gold-medal U.S.A. eight at the Tokyo Olympics. Despite the reshuffle, and a very unfit Hugh Foley, the crew won. John Shanasy, who had rowed despite having been badly shaken by the car accident, was taken to hospital for observation after the race. The 1969 King's Cup crew was chosen quickly by David Boykett and the selectors. It included Graeme Boykett (stroke), Stephen Gillon (7), David Douglas (6), John Shanasy (2) and Geoff Godkin (cox). John Harry, then a member of Melbourne University but soon to transfer to Mercantile, rowed 5. The crew was one of those for which everything seemed to fall into place. It rapidly developed stride, bladework and spirit, and worked very hard. At Bundaberg, Victoria won its heat against South Australia easily. The final was held on a clear warm day with a slight holding head breeze. Victoria shot out of the start at 47, took 2 1/2 lengths by the 1000 metre mark, and coasted home to win by 1/2 length in 5 minutes 59 seconds. The 1969-70 racing season was again a success, but a patchy form was showing in maiden and junior ranks. The club won the senior and junior premierships, as well as the senior eight and junior four championships. Wins in most classes were recorded at the pre-Christmas and Christmas regattas. 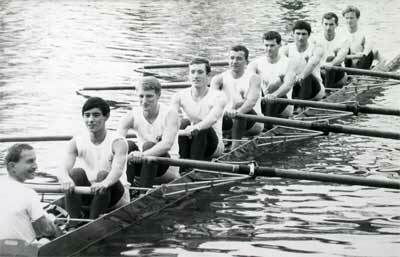 At the first race thereafter, the club won Senior Eight, Junior Eight, Junior Four and Thames Four. The Senior Eight consisted of Boykett, Gillon, Douglas, Harry, Palfreyman, Shanasy and newcomers John Gumley (3) and Les Ayres (2). The club won the Senior Eight and Junior Eight and Four at the next two regattas, and the Senior Eight won the Championship at Ballarat by one length after having trailed Yarra Yarra most of the distance. David Boykett was again chosen as King's Cup coach and all Mercantile representatives from the previous year held their places in the crew which won the King's Cup narrowly from South Australia. David Boykett was appointed coach of the Australian Eight, which included Graham Boykett, Gillon and Douglas. The Australian Eight was not impressive in training through the Victorian winter, but picked up form in the United States, and had developed considerable speed when it reached St. Catharines for the World Championships. The Eight, in a sensational incident, was left at the start of the semi-final with the coxswain's hand in the air. Thomi Keller of F.I.S.A. solved the dilemma by allowing the Eight to start in the final on lane zero, after rowing a trial course in a set time of less than six minutes. Keller's judgement was borne out when the Eight finished fifth, in 5 minutes 43 seconds, seven seconds behind the lightning fast East Germans.